As a company, Liniar has a strong belief in being environmentally friendly – so when asked to take part in a sustainability project in South Yorkshire the team was delighted to offer assistance. The Carillion Rail-organised Sustainability Week concluded with a day of events at the beautiful Manvers Lake in Rotherham, with a team of managers working alongside students from Sheffield Hallam University and Dearne Valley College in a variety of team building activities. As well as various fun events, such as canoeing, kayaking, dragon boat race training and some rather dodgy raft building, the voluntary work also included clearing out an overgrown culvert, filling in pathways to eliminate tripping hazards, clearing vegetation to extend the slalom pond, and preventing embankment erosion. And this is where Liniar came in. Liniar sales director Mark Sims swapped his suit for scruffs for the day and arrived with a van full of plastic piling, two piling caps and a huge rubber mallet, fully prepared to get stuck in and to help the volunteers to protect one of the eroding banks around the lake. Despite warnings of thunderstorms, the sky was clear and the sun blazed for what was one of the hottest days of the year – probably not ideal weather for hard manual labour, but everyone got down to it nonetheless. 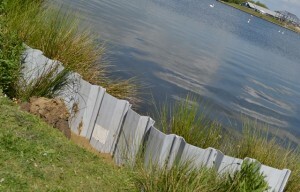 Because Manvers Lake is so big, waves have started to erode the section of bank in question and vital work was needed to prevent this from getting any worse. 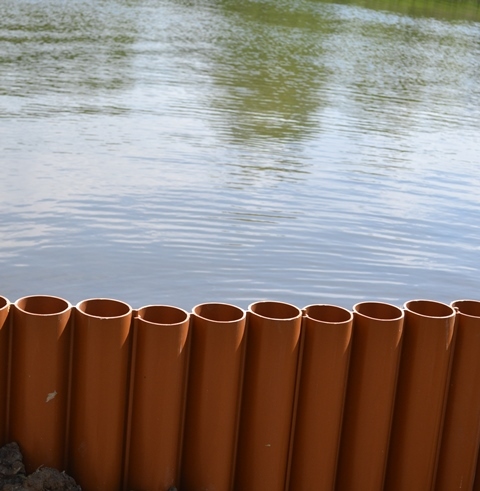 Liniar’s plastic log piling was spotted by the event organiser, Carillion Engineering Manager Becki Finch, at the recent RailTex exhibition at the NEC, and she immediately identified it as the ideal product for the job. Because of its lightweight properties and ease of installation, log piling is perfect for any kind of retention task. The fact that it’s manufactured in the UK from 100% recycled material, doesn’t rot, rust or leach chemicals into the ground, meant that it would be ideal for an event of this kind. It’s also covered externally with a timber composite finish to give it a natural look and enable algae or moss to grow on it – so that it blends in beautifully with the natural habitat. As the first group of eager volunteers arrived in the morning to begin work, Mark rolled up his sleeves and demonstrated how easy the log piling was to install. Simply slotting together and located in position, the driving cap is inserted into the top of the ‘logs’ and then it’s just a case of hitting it very hard with the rubber mallet to drive it down into the ground – it really is that easy. Although this is a very simple process, as the morning temperature was already racing towards 20°C, it wasn’t quite the stroll in the park that it might have been. A great deal of sweat was shed throughout the day as the sun-baked volunteers successfully installed the piling before battling on with the tiring process of back filling the bank behind it and then, finally, filling the hollow logs with gravel for even greater strength. As well as repairing the eroded bank, Liniar also provided some sheet pile to protect a small area of embankment further along the lake. Installed by exactly the same method only with a different driving cap, this proved to be a quick and simple process for the volunteers. A fun, tiring and successful day was rounded off with a drop of sparkling perry for all involved, along with a social BBQ and some words of thanks from the organisers. 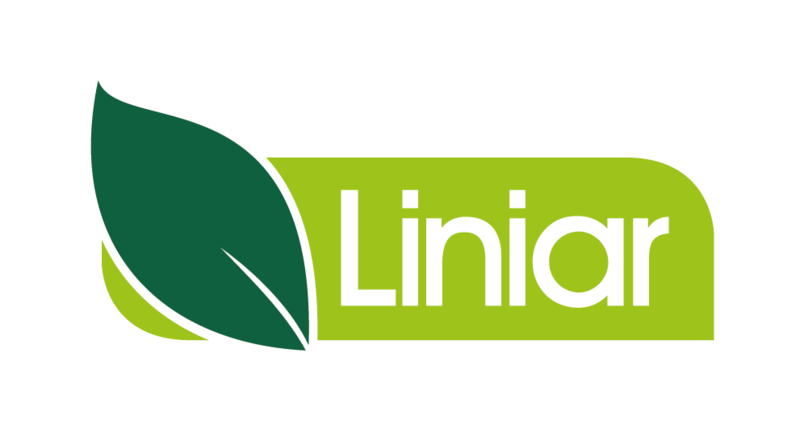 Event organiser Becki Finch thanked Liniar for its involvement: “We’re very grateful to Mark and his team for assisting with this worthwhile project. 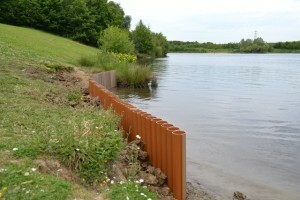 The plastic piling they’ve donated and helped to install has gone a long way to repairing and protecting the banks of this gorgeous lake. “The fact that the Liniar piling is made from 100% recycled uPVC and is friendly to the environment means that it was the only choice for a sustainability event such as this. 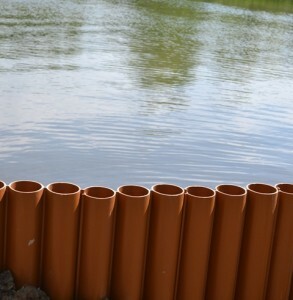 Click here to see how volunteers installed Liniar piling at the event.